Thank you for visiting Custom Garage Works! Over a decade ago in 2003, we started out by offering top quality garage floor coating in Azle,TX. We set out to create the perfect garage for ourselves and our growing families, and when we couldn’t find what we were searching for within the existing industry, we decided to jump in ourselves. Now, we proudly provide professional garage organization solutions, along with top-of-the-line polyurea polyaspartic floor coatings, that have a significantly longer lifespan than epoxy. We are passionate about fantastic garages, and while we began with a simple garage floor coating service, we are proud to provide many additional custom garage solutions to the DFW area. 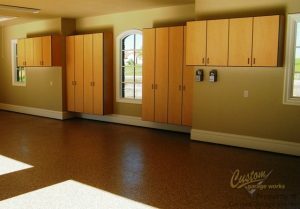 One of our most common garage services is our garage floor coating in Azle, TX. This is due to the fact that our polyurea polyaspartic coatings create a superior finish that remains for decades. Unlike epoxy that can yellow in the sun, and peel or fall off over time, these coatings are stronger and more durable. In addition to our floor preparation, which incorporates professional diamond grinding, as opposed to acid etching, you end up with a showroom quality floor that is easy to clean, and practically indestructible. If you’re looking to learn more about our professional garage floor coating services, give us a call at 214-494-9068 or 817-308-1305 and schedule your free estimate! Garage Floor Grinding Our choice of diamond grinding is a more effective choice for of preparing your garage floor for coating. And More! If you’d like to learn more about the services we offer, you can check them out here! As for storage, you’ll never have to wade through piles of clutter in your garage again when you choose a storage solution from Custom Garage Works. 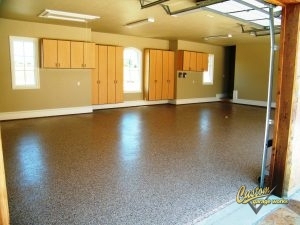 We realize that a brand new garage floor looks best when it won’t be covered by other items in your garage. We provide a selection of solutions to organize your belongings, including overhead storage racks and garage cabinets. We carry some of the most resilient overhead storage racks in the industry, and our storage cabinets are specifically made for garage needs. We are committed to helping our clients obtain the perfect garage floor coating and organization for their needs and budget, and we look forward to assisting you! Storage Cabinets Unlike traditional cabinets, ours are designed specifically to help you get the most out of your garage space! Car Lifts A residential garage auto lift is easier to use than you might think! And More! Our organization solutions are affordable and efficient ways to improve the aesthetic and atmosphere of your garage.